Before Bean turned 9 we began using Logic of English Essentials for language arts. I fell in love with the program (you can read about it here) and really didn’t want to part with it once she entered Classical Conversations Essentials. CC Essentials utilizes Andrew Pudewa’s Institute of Excellence in Writing (IEW) for writing skills while spelling and grammar lessons are offered through CC’s Essentials of the English Language (EEL) curriculum. Logic of English covers spelling, reading, vocabulary, and grammar, so there is some overlap between EEL and LOE. I have found EEL’s grammar and spelling program is not as well organized as LOE. After taking a good look at how it would all piece together I decided to use both Essentials programs side-by-side, omitting the excess from the program I felt was less thorough, EEL. At first, I was pretty overwhelmed. We chose not to put much emphasis on the vocabulary work in IEW, though we did cut out the flash cards and I encouraged Bean to include those words in her writing. We omitted EEL’s grammar, editing, and spelling program, because as many CC Essentials moms can attest, it’s really not laid out in the most user-friendly format. We continued copying charts, diagramming sentences and of course following along in class. Trying to fit the charts and diagramming into our day along with IEW work and LOE’s full schedule was tough! 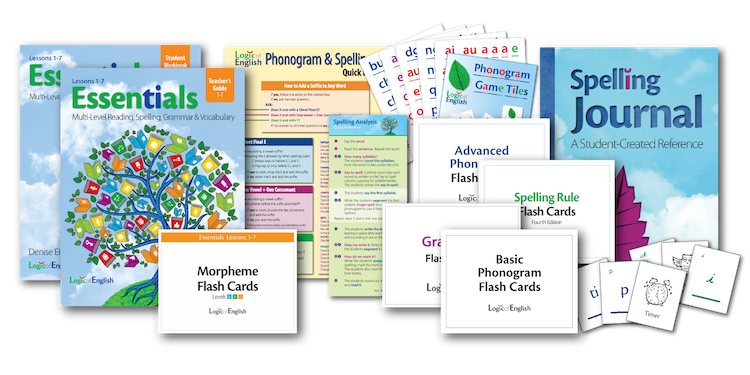 Anyone who already uses LOE Essentials knows that those lessons can often be quite long. Trying to squeeze it in 5 days a week was really tough, especially since one of our weekdays was consumed by CC. Between writing assignments for IEW, copying charts for EEL, and all the intricacies of LOE Essentials work, we were exhausted! Bean was stressed, I was stressed, and we were both feeling perpetually behind. So this is how we do it now- and this is going to sound really simple… are you ready? I let it go the way it goes with Logic of English. It’s that easy. LOE is organized as a 5-day curriculum over three levels, but as I mentioned in my review, it can be flexible if you let it. Instead of trying to get a full lesson completed each week (working 5 days), we shifted focus to working on LOE every school day that didn’t include our CC day. I let go of any expectations about how much we had to complete each day, and decided we would just be sure to work on it daily on our non-CC days. Once I adjusted my expectations, we were both much more comfortable. Most weeks, we got anywhere from 2-4 days of LOE completed as we progressed through LOE for the first time in level A. Sometimes we spread one LOE “day” over two actual days; other times we squeezed two LOE “days” into one actual day. It took us about one calendar year to complete level A in Volume 1 of LOE Essentials, but it was the perfect pace for us. Logic of English Essentials is organized into three levels: A, B, and C. Like CC Essentials, many concepts are repeatedly studied at each level (spiral method), so as you progress through the program some parts get easier. The beautiful thing is, once we started repeating sections of lessons as we progressed though the next level (B) this year, it all began to go significantly faster. Bean began LOE Essentials B in Volume 1 last spring (Lessons 16-30 were not released yet when she completed level A) so now some concepts are coming back around again. I purchased the digital version of the workbook and each week I print off the necessary pages for the next full LOE 5-day lesson. With the combination of the EEL charts, CC Foundations grammar memory work, and LOE level A, some spelling and grammar rules really don’t need extra practice when they come around again in LOE so as I select pages for level B, I decide which activities Bean needs to repeat in the sections labeled “all.” I don’t make any real goals about how much to complete in the week ahead. Instead, I just print the pages I’ll need for the next whole lesson, no matter how soon it will be completed. Once it’s complete, I print the pages for the next lesson. We store all the printed lesson pages in sheet protectors in a binder, all the pages for one lesson slipped into one sheet protector. We place the Spelling Analysis page in front so it can be used in composition or other activities in later lessons at a quick glance. All the pages printed for one lesson go in one sheet protector. If it’s your first time through LOE Essentials, take your time. Look forward to going through it at the next level, as it will allow you extra time to focus on IEW and EEL. The combination of these three curriculums is a slam dunk. I have seen vast improvements in my daughter’s grammar, spelling, vocabulary, and composition since utilizing LOE and CC Essentials. They can really complement one another if you can manage to balance them all to your student’s needs. Just don’t let yourself drown in the material! This is homeschool; cherry pick what you like from each and apply it. Don’t be afraid to tell your Essentials tutor what you are/aren’t participating in through Essentials, either. You will find that they, too, are trying to make the best decisions for their children as well and are quite likely to be understanding. (For instance, I told our tutor that we weren’t going to be publishing final drafts of IEW papers with all the markings recommended in the curriculum- it was just taking too much of our time. She totally understood!) I hope that you will be able to balance CC and LOE Essentials programs in a way that works for your family if that’s the route you choose to take! A little extra honesty here: We recently left our Classical Conversations community (a post for another day I’m afraid! ), so while this was primarily written while we were still attending community day, we now have a full five-day school week at home. We are still utilizing our Foundations Guide and learning the memory work every week and we’re still using IEW, but now at our own pace, a little more thoroughly (and without the long drive!). We haven’t done much with EEL though. I now allow Bean to choose between working on LOE or IEW each day. We are still cruising through both programs at a decent pace, but it’s all a little different since we stopped attending community day and now have more flexible work time. We are still working out the kinks of our new routine, but we’ll get there. Once we have it all figured out (but really, do we ever? Haha), I will make another post to show how we’re continuing to use CC at home with LOE. Thank you for visiting my blog! If you like what you see, please share and click “follow” so you’ll be notified every time I make a post. Alternately, you can follow me on Facebook or Instagram and you’ll always be in the loop! Whew! It has been one crazy fun summer for our Ohana (family). We took a long trip to the mainland U.S., with stops in Chicago, Washington D.C., New York City, Boston, Connecticut, and Vermont. Needless to say, we are all EXHAUSTED. I’m sure I’ll write up something about our adventures and how we made our trip tie into our homeschool, but for now I have to share about this great new book from Logic of English (LOE). It has helped us jump back into schoolwork smoothly and without complaint!